The World Champions Australia will be a tough nut to crack for France in the quarterfinal match. Even though France have been the surprise package of the 2018 World Cup, beating the Kukaburras is still asking too much from them. However, Jeroen Delmee's side will leave no stone unturned to give them a tough fight. France lost the opening game of their campaign against New Zealand but drew 1-1 against the gritty Spanish team in their second league match. The biggest shocker came when Les Blues defeated Rio Olympic gold medalists Argentina 5-3 in the 3rd league match. Captain Victor Charlet has led from the front and been a delight to watch on the field. The 18-year-old forward Timothee Clement has been impressive while attacking and he is the one who scored the solitary goal of the match in France's 1-0 win over China in the crossover game. Hugo Genestet, Tom Genestet, Coisne, and Goyet are the other players to look forward to in the French line-up. 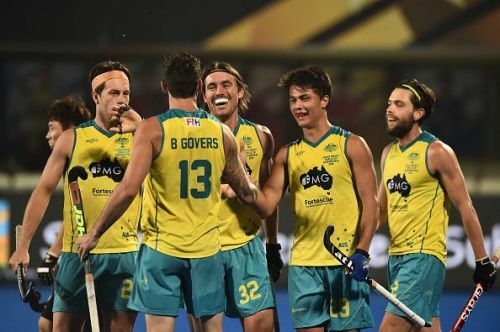 The Kookaburras have had an unbeaten streak in the World Cup. They won all three of their league games -- the first was a 2-1 win over Ireland, the second a 3-0 win over England, and the third an 11-0 win over China. Australia really showed that they are a champion side in the massive win against China. Colin Batch would be happy with his boys -- which is a perfect blend of old and young players. Corey Weyer, Matthew Swann, and Jeremy Hayward have been resolute in taking care of Australia's backline. Tom Craig, Aran Zalewski, Flynn Ogilvie, and Daniel Beale have managed things well in the midfield. Blake Govers, Trent Mitton, Tim Brand, Dylan Wotherspoon, and Jacob Whetton have been exceptional up front. All in all, Australia is at their very best and is likely to continue their unbeaten streak as they lock horns with France in the quarterfinal match. The Kookaburras and Les Blues have clashed thrice since 2013. Australia went on to win all these three games. They won 3-2 when the two last met at the 2017 World League. Prior to that Australia thrashed France 10-0 during the 2015 World League. The odds are all in favour of the defending champions but it would not be a one-sided affair as the French players are playing with such confidence and displaying great skills.